April 22, 2016, 10:21 a.m.
Out of the 4081 strong – and growing – sample of writers YouGov currently collects data on, William Shakespeare is the third most popular, slightly below contemporary classics JK Rowling and Terry Pratchett but above Tolkien, Orwell, Roald Dahl and Dickens – not bad for someone born 452 years ago. As the world celebrates the impact on language and literature of perhaps the most significant writer in history on the 400th anniversary of his death, new YouGov research reveals the Shakespeare plays that are most popular today. On average British people have read or seen around 5 of shakespeare&apos;s plays, which is understandable given his place in the curriculum and the numerous hollywood adaptaptations of his stories. There&apos;s a class difference – middle class people say they know 6 plays on average; working class people say they know 4 – and also a gender difference, with women knowing on average two more (6) than men (4). Over 65&apos;s claim to know as many as 7. But the plays aren&apos;t all equal in popularity. 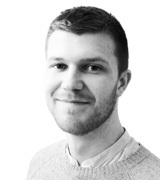 We&apos;ve divided them into four categories of saturation – mainstream, popular, niche and underground. If you know Pericles (the least-known play) you&apos;re a die-hard fan – more so than someone who knows King Lear (niche, with 17%). 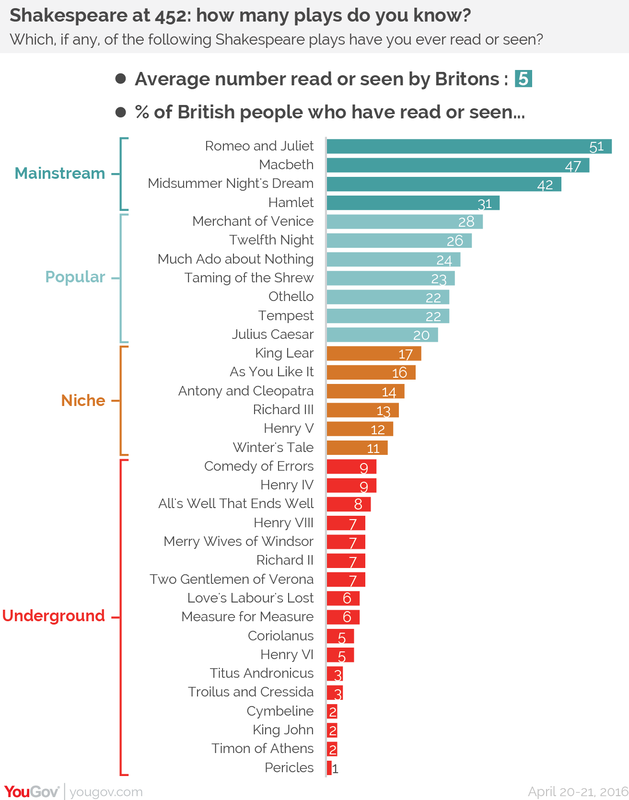 If you know Othello you&apos;re not alone (popular, with 22% saturation), but you&apos;re more of a committed fan than those who only know Macbeth (mainstream, with 47%). Romeo and Juliet tops the popularity list, but interestingly is far more popular among 18-24s. Fully 72% of the youngest generation know this play, owing surely to Baz Luhrmann&apos;s screen adaptation starring Leonardo DiCaprio, which is the highest score for any play in any major demographic. Among over-65s Midsummer Night&apos;s Dream is the most popular play with 52% saturation, while the Merchant of Venice (44%) is an equal to Romeo and Juliet (45%) and Macbeth (44%).